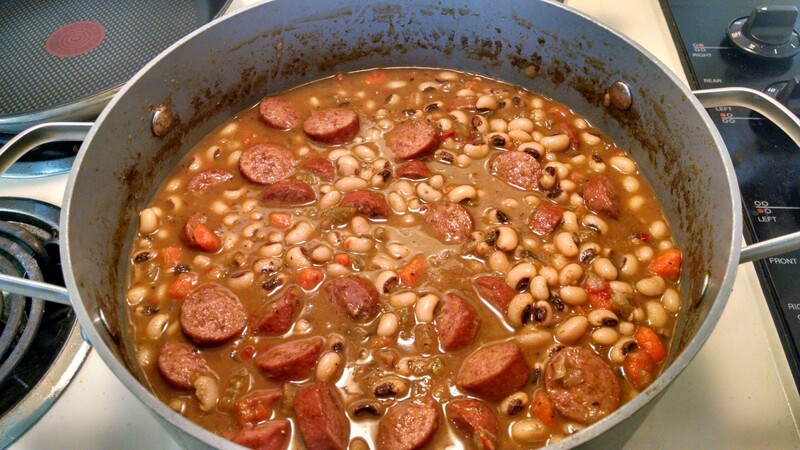 As I do every year on January 1st, I headed into the kitchen to make black-eyed peas. It is a tradition I carry with me from my native New Orleans, and a tasty one at that. Every year after I stuff myself full of a couple of bowls full of yumminess, with a side of something green and leafy (this year is was brussels sprouts) and some cornbread, I wonder why the poor legumes seem relegated to a once a year trip to my dinner table. For those of you who don't follow this tradition, or some variation of it, black-eyed peas are supposed to bring us luck in the new year. Often some form of pork is added to the pot for flavor and to add some good fortune. And the greens represent money. The cornbread? It just tastes great! But as I was cooking, I thought about how useful it is to have cookbooks. A recipe to follow gives me ages of insight and the best of many cooks' trials and errors. It distills the instructions down to a simple list of ingredients and a to do list. If I follow the recipe I will end up with at least a fair representation of the dish. It's not like I put the ingredients for black-eyed peas in the pan and would ever end up with beef stroganoff. It's a tried and true system. I may mess up or substitute one ingredient for another, because I didn't have something in my fridge or because I have followed the recipe before and want to experiment a little, but having a plan is always good. That's how I often use recipes, as a starting point. The black-eyed peas I made this year weren't exactly like last year's or any other year's. And I discovered a really cool whole wheat bread recipe that I likewise, modified, in terms of process, rather than ingredients. Here's the recipe, by the way. The main variation I made to process was to make the dough in the bread machine and then take it out to rise, cut into two loaves and bake them in the oven. Side note for those not well versed in the kitchen. Cooking is much more forgiving of experimenting than baking. Cooking is more art and baking is science. Measuring rules in baking. OK, I'm over simplifying a bit and going a bit astray here but I have been cooking a lot this weekend so bear with me. One final note on the measuring thing. 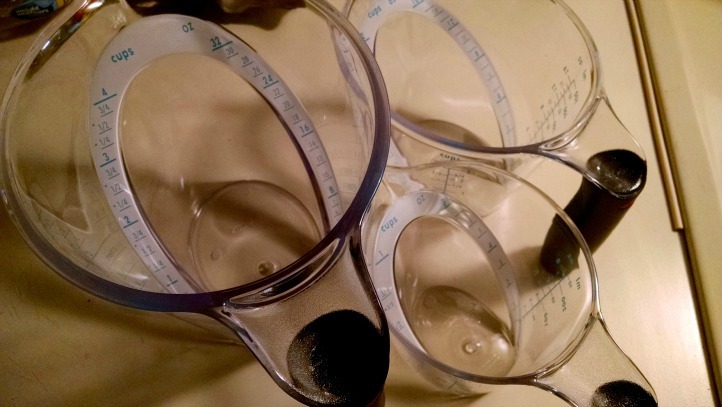 I got a set of really cool measuring cups for Christmas. It is one of those things you look at and go, wow, that is so obvious, why did it take all these years for someone do to this. It is a creative solution to the age old issue of trying to fill the cups and keep holding them up to see if you have hit the line on the side of the cup corresponding to amount of the ingregient I need. These cups, by OXO put the measurements along the outside of the cup but also on a sloped scale that is visible while looking into the cups. It is a great reminder about seemingly small adaptations to old things that can be very innovative. By now you might be starting to suspect that this post isn't just about cooking. You would be right. I love lists of all types. And systems. And checklists. And constantly looking for better ways to get things done. All sorts of things that make my work and life easier. Last year, wow, it still feels funny saying that about things not that long ago, I heard Taylor Croonquist of Nuts & Bolts Speed Training use the acronym RATs which stood for Repetitive Annoying Tasks. Yep, I think those critters should be exterminated. If you find yourself doing the same thing over and over, it is likely a good candidate for some sort of automation (like creating Styles in Word documents) or a process or a checklist. Things that you do over and over become things we don't pay as much attention to and sometimes that's OK but often its not. Like if you are a doctor or pilot as Atul Gawande wrote about in The Checklist Manifesto. So yes, I write lots of lists. 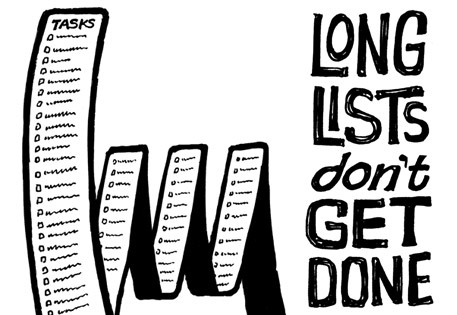 I used to write long lists, but I learned first hand and then read some validation in Rework that long lists don't work. And if that weren't enough, Sir Richard Branson recently offered similar advice on Virgin's website for people making resolutions. If it's a good enough system for him, it's good enough for me. Now I write shorter, targeted lists. What is the magic number of items for a list? I can't say for you, but I would suggest you experiment with breaking up your list into smaller pieces that you can knock out and experience the positive feedback of making progress which will encourage you to keep chipping away at the list. It is much like the old joke about how you eat and elephant ... one bite at a time. So, off you go. Start getting things organized. The first full week of the year is ready for you to get going. Oh, and a last thing for today because I know someone will ask. How do I keep this lists? Well, I like old and new school. I am rarely, if ever, without a notebook and some brightly colored pens. Why colored pens? They are fun and they help me separate groups of items into visual chunks by changing color pens. I also love Google Keep since I can pull up my lists on my phone, or tablet, or computer. Basically anytime, anywhere. Once again, I am not alone in my praise for this little known tool. PC Magazine gave us 7 Reasons You Might Actually Want to Use Google Keep. But again, find what works for you.